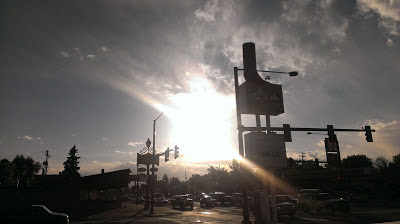 I've driven past the large cowboy boot atop a sign advertising the space on the Southeast corner of Syracuse and Colfax many times. I even stepped inside the boxy building beneath the sunset shadows of this infamous footwear (years before starting this blog) when it was a Salvadorean place. I tasted a good assortment of food from Central America's smallest country only to see it shuttered the next time I tried to go. I wasn't heartbroken, as I can often be when my favorite little restaurants close down, as there are other good pupusas just down the road, but since it has been at least two other places (including one sketchy night club that I think really was called La Bota) since that time, I was understandably hesitant to venture back inside when it re-opened a couple years back as El Tamarindo. I finally did go the other day, when a craving for some East Colfax fried masa had me scratching my head for a new option on this well-trodden strip of city where Denver meets Aurora. We settled on Tamarindo, which claims to be the only place in Denver where one can enjoy cuisine from all seven countries of Central America. We took advantage of that claim, ordering the first thing on the menu: Garnachas de carne from Guatemala. 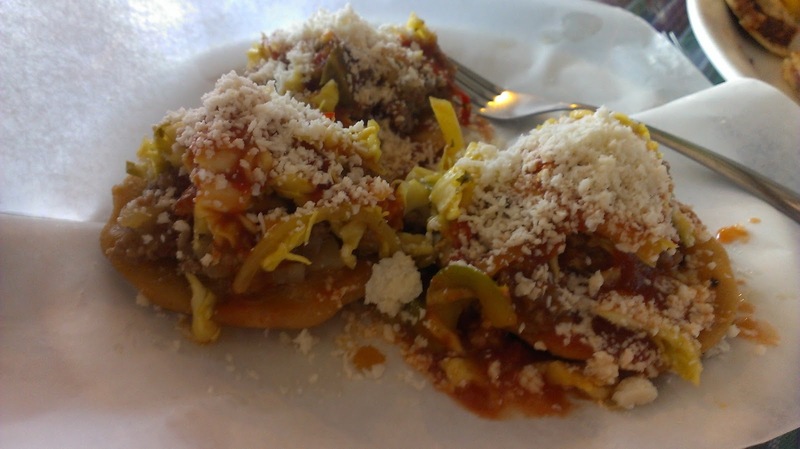 A scoop of beef and potato picadillo covered a thick circular base of fried masa not unlike a sope, that was topped with a cabbage slaw, salsa and grated cotija-like cheese. Not sure how they rate on the "just-like-back-in-Guatemala-scale", but every part of it was delicious and it was a fabulous start to our meal. Next up was a baleada, a Honduran quesadilla-like staple made with a super soft flour tortilla, this one stuffed with silky refried beans and rich crema. It was outstanding, and good to see after the Honduran food truck I stumbled upon last year seems to have disappeared. The rest of the food as far as I could tell was strictly Salvadorean. 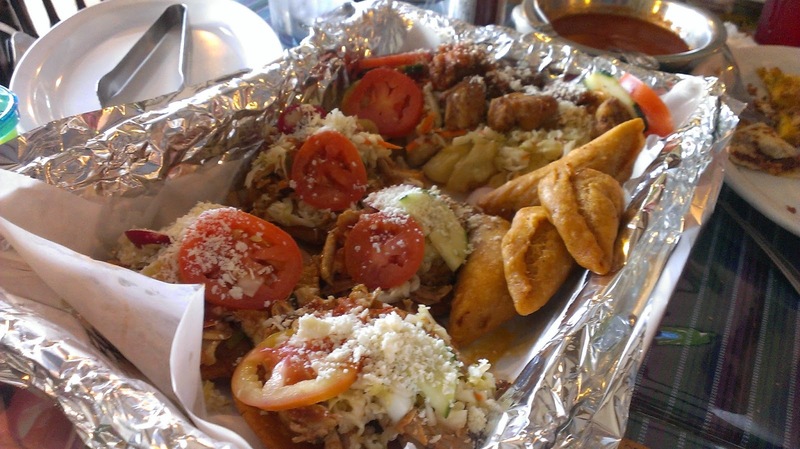 And when we ordered the combo platter for four, it became nothing less than a Salvadorean feast. The feast of course included pupusas. 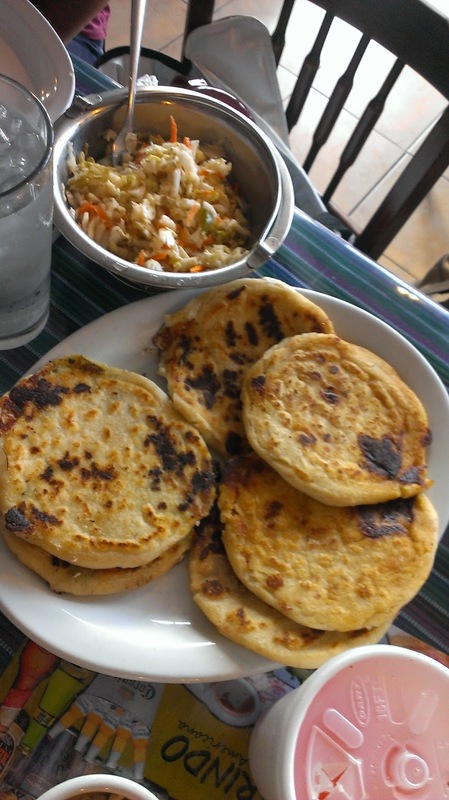 Wonderful, wonderful pupusas. They had that perfect char, a nice proportion of gooey cheese and things like squash, chicharrónes and beans; and though the slaw topping was a little wilted, the bright tomato salsa saved it, as did the respectably spicy house made habenro sauce. 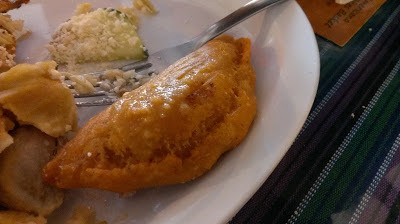 The empanadas were deep fried and filled with the same beef picadillo as the garnachas, which is to say, they were excellent. We also had the Salvadorean-style enchiladas, meaning nothing like the Mexican or New-Mexican rolls of tortilla most of us know. They are more like a sope as well, and these were just OK as the masa tasted old, and the chicken was flavorless. 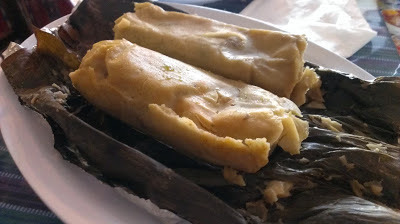 Also on the not-so-good side were the gigantic tamales. They looked great: fat masa rolls still steaming on top of their banana leaf husks--but they were not great. If it was 1988 and I were my high school self again, I would have said they were, "straight nasty." Dry, flavorless and filled with large chunks of overcooked meat. The current owners are from El Salvador, which makes sense, given the menu bias. They didn't seem to represent all of Central America that well, but to be fair I didn't get a chance to go over the menu in excruciating detail. I didn't see the typical plates like gallo pinto or vigaron from Nicaragua or Costa Rica. Panama and Belize? Not too familiar with their platos tipicos, but didn't see anything on the menu from there either. 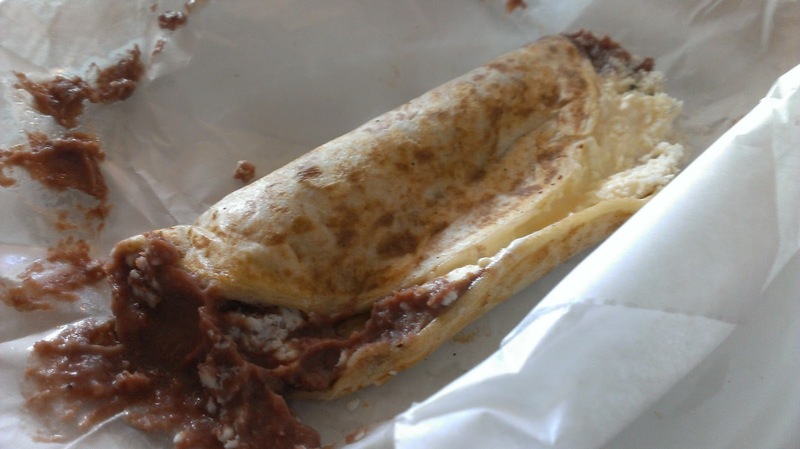 So if you are in the mood for some good dishes representing 3/4 of northern Central America, El Tamarindo is your place. In other words, if you want some good Salvadorean food and maybe a sampling of other neighboring countries' dishes, check it out, and if you have time (read: you don't dine with 2 year old twins) maybe you'll see the other Central American specialties I missed. This looks incredible! I can't wait to give a try. I LOVE papusas and those masa look amazing!